Americans are obsessed with master baths—en suite restrooms with double vanities and bowl sinks, soaking tubs, showers the size of lower Manhattan, Tibeca with body jets and mosaic tile. They have personal spas beyond their bedroom doors—spaces to retreat to—places to get away from. 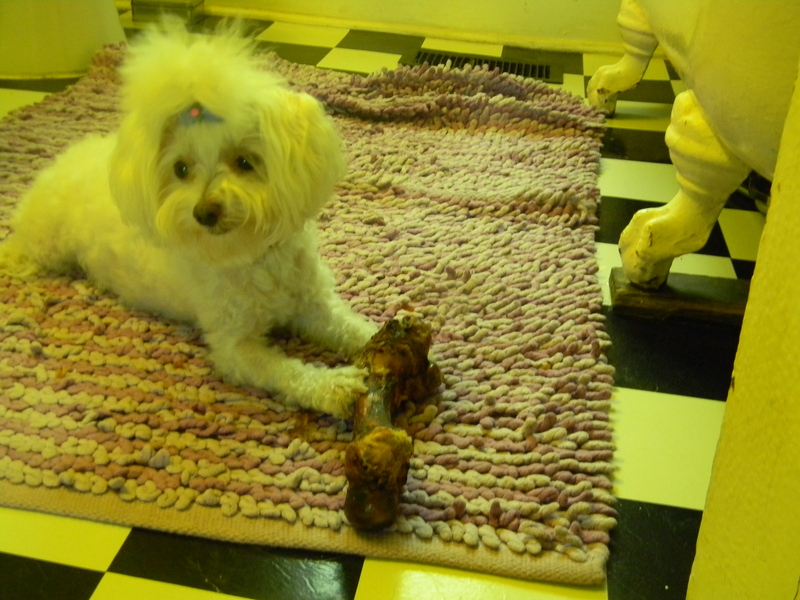 Sara and I aren’t master bath kinds of people, apparently—or so Sara, my partner, says—pointing out that I share our downstairs bath—the one nearest the master bedroom—with my Maltese Lucy rather than with her. Dogs may be man’s best friend, but what does it say about me that I share my restroom with a canine companion, and how exactly does this sharing work? How did it come to be? It’s simple enough really—and purely practical. Sara takes showers; I prefer baths. We’ve made bathroom assignments accordingly. 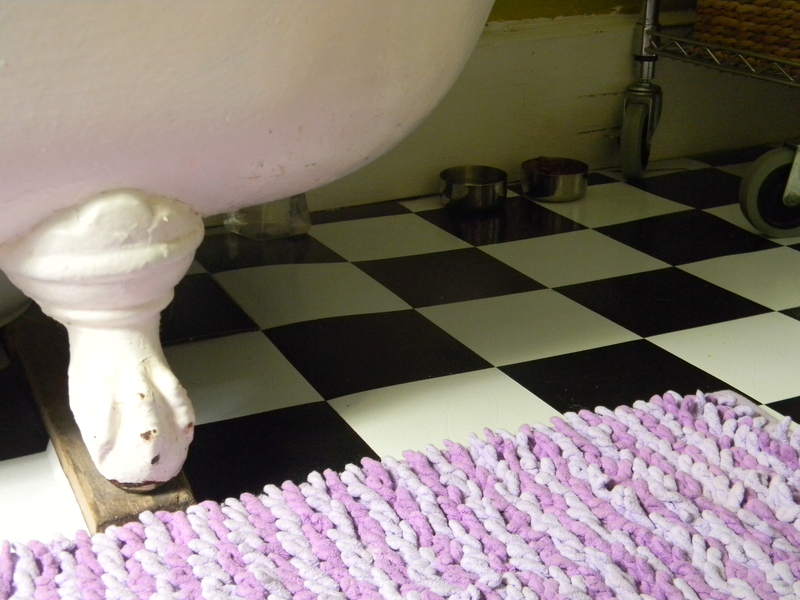 But our downstairs bathroom, in addition to boasting the more common attractions—toilet, sink, and fabulous tub—is where we keep Lucy’s food and water bowls, so she can eat separately from our larger dog Ralph, who insists on devouring her dinner, even if his bowl runneth over with Iams. 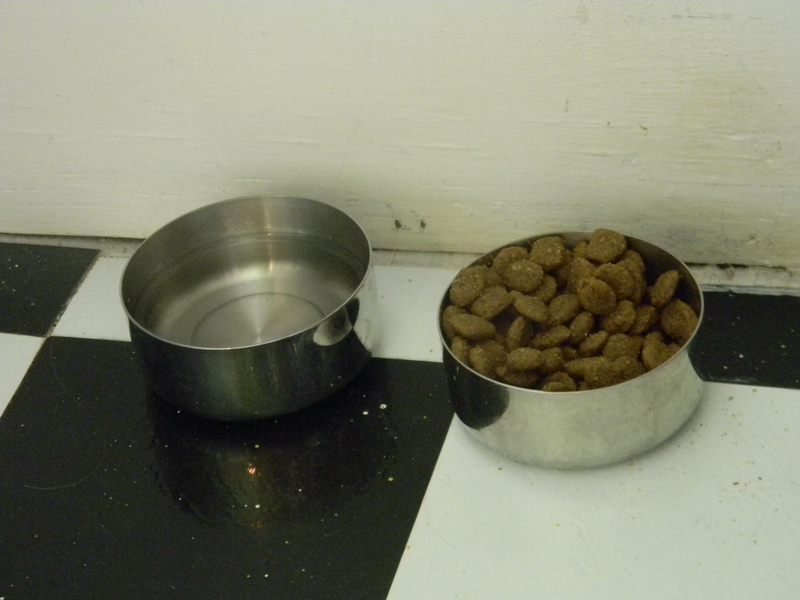 This eating arrangement both assures Lucy gets fed and allows me to monitor how much she is or isn’t eating. 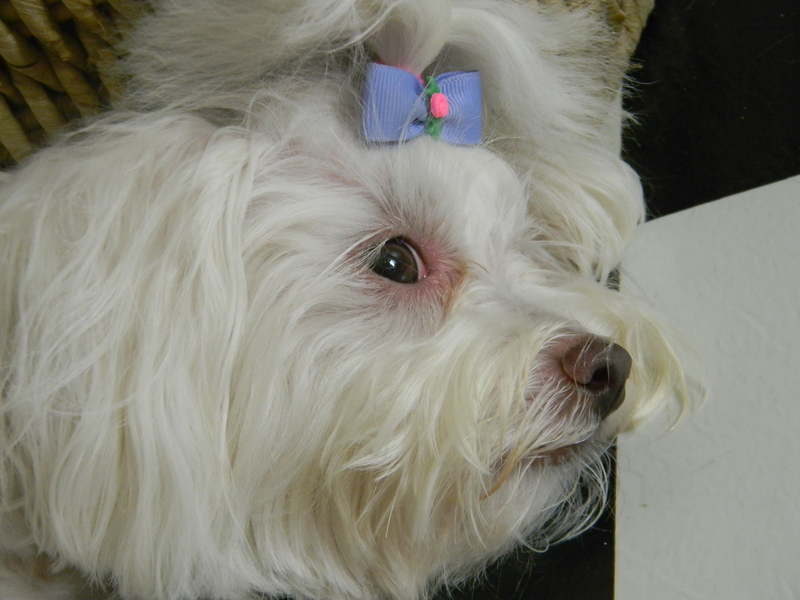 I feed her while taking a bath—stretched out in my claw foot tub, watching the flat screen TV that’s perched atop the toilet tank—surrendering to popular culture even as I exfoliate my face and shave my legs. I know the television may be a little over the top, but if you’ve never enjoyed a good soak in a deep tub while simultaneously watching HGTV’s “House Hunters International” or CNN’s the “Situation Room,” then you haven’t truly lived, my friend. You’ve been deprived. 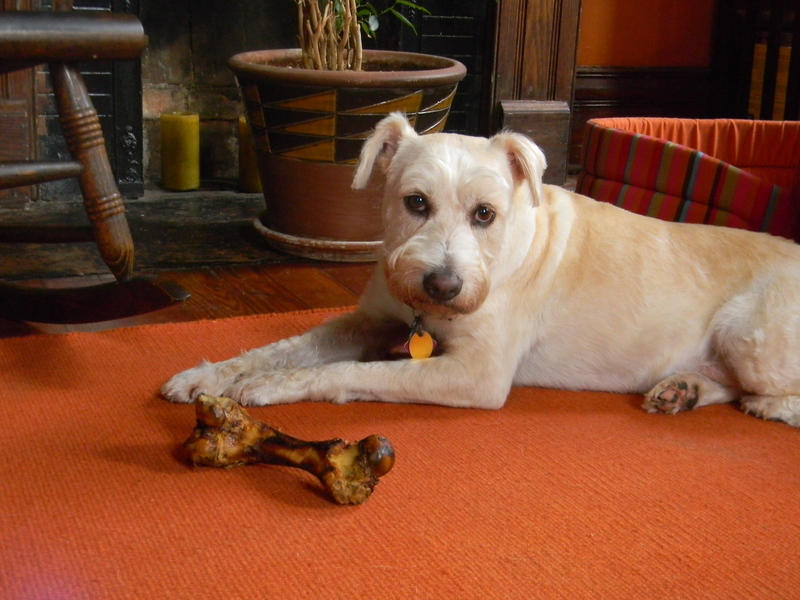 It’s also a space where she feels safe to boss her big brother around—a 40 pound terrier mix who tolerates her ego with a larger-dog dignity. Ralph doesn’t mind. He toes the line. And so do we. It may be true that, for a long time, I’ve been interested in the way space defines people—the ways we as human beings define the places we inhabit and how that impacts the way we live. 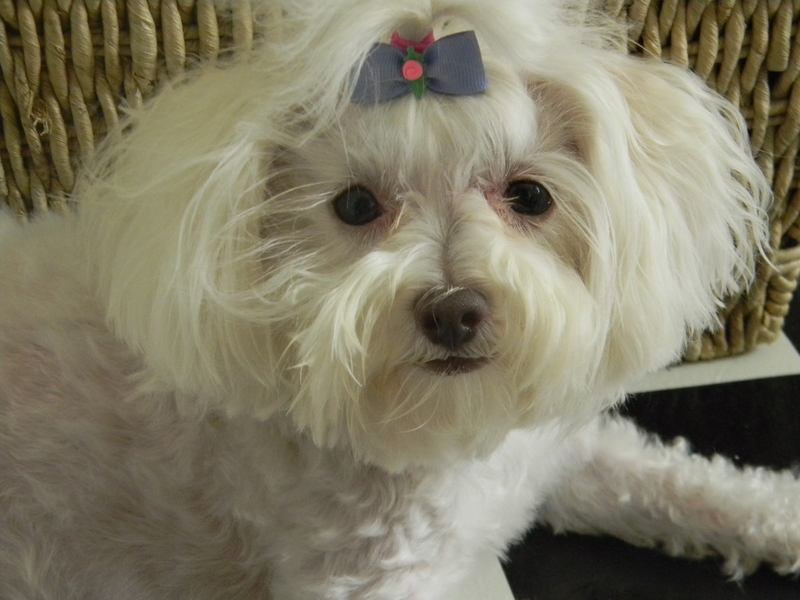 In this instance, however, it’s a seven pound white dog who’s running the show—a little dog with deafening bark and larger-than-life personality, guarding the bathroom door as if her food supply, her fluffy life, depended on it. She’s a lapdog with license to kill, her loud mouth a not-so-concealed weapon whipped out at will. It’s clear. 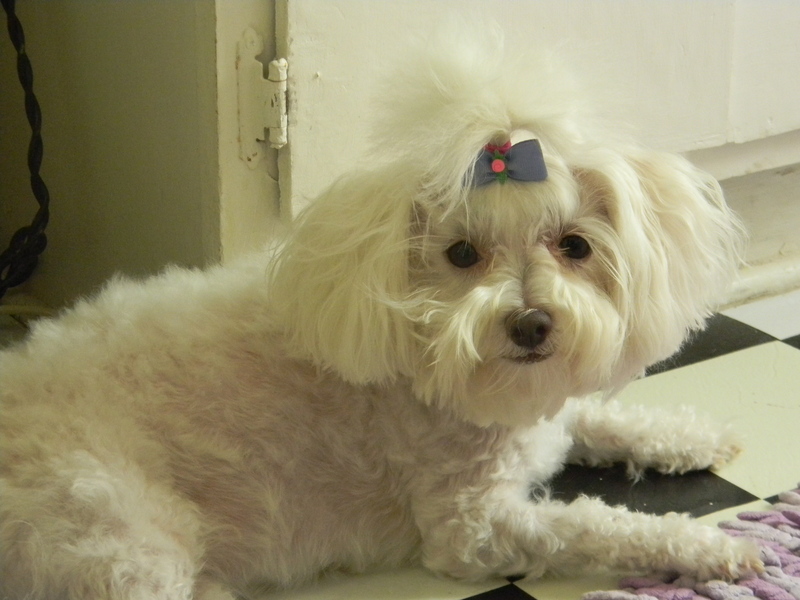 Lucy likes to maintain order—her order—an approach to home management that’s not only pet-oriented but canine-centric—“I love Lucy” in a very puppy perfect way. So what then does this say about our wanna-be master bath? About who we are and how we live? Sara says this space, like our lives, has gone to the dogs. Is she barking up the wrong tree? 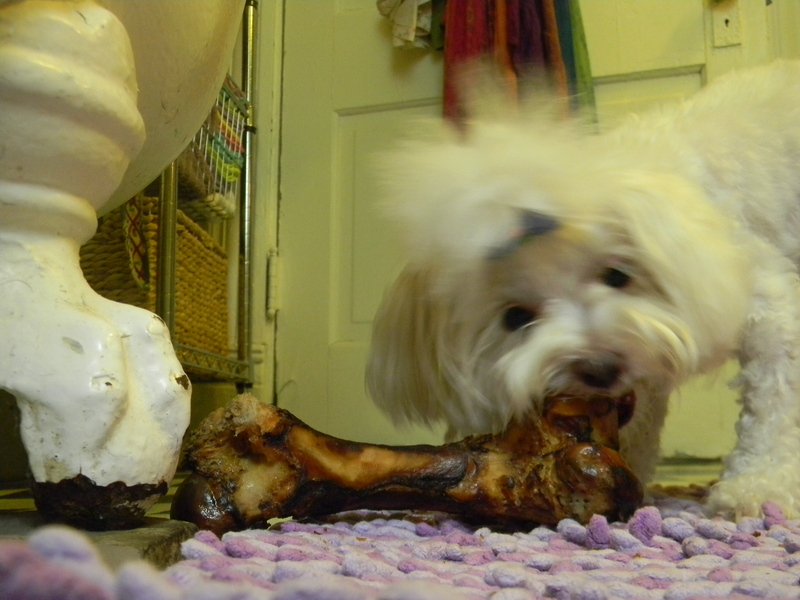 This entry was posted in dogs, home, humor, LGBT issues, pets, television and tagged bathroom, bone, clawfoot tub, dogs, home, humor, lesbian, life, Maltese, master bath, pets, postaweek2011. Bookmark the permalink. 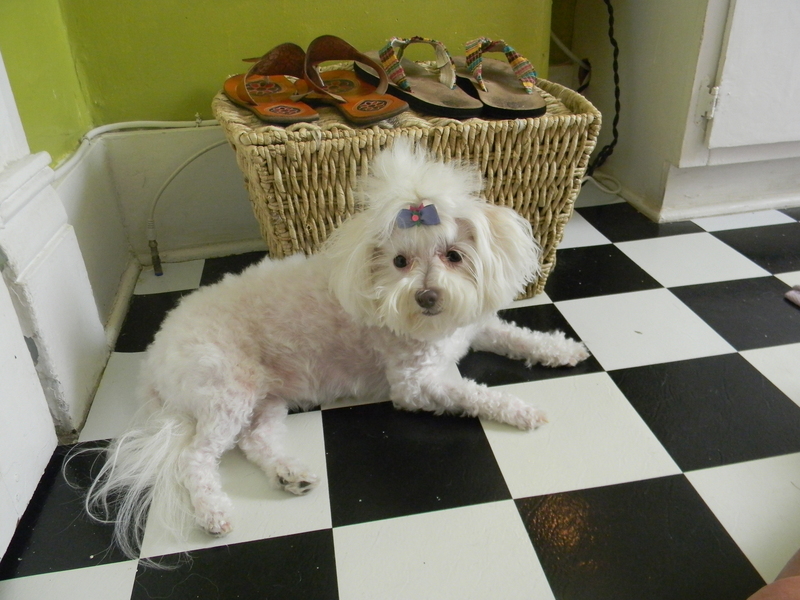 As I write this, Roxie – our oldest female, is lounging in our master bathroom. 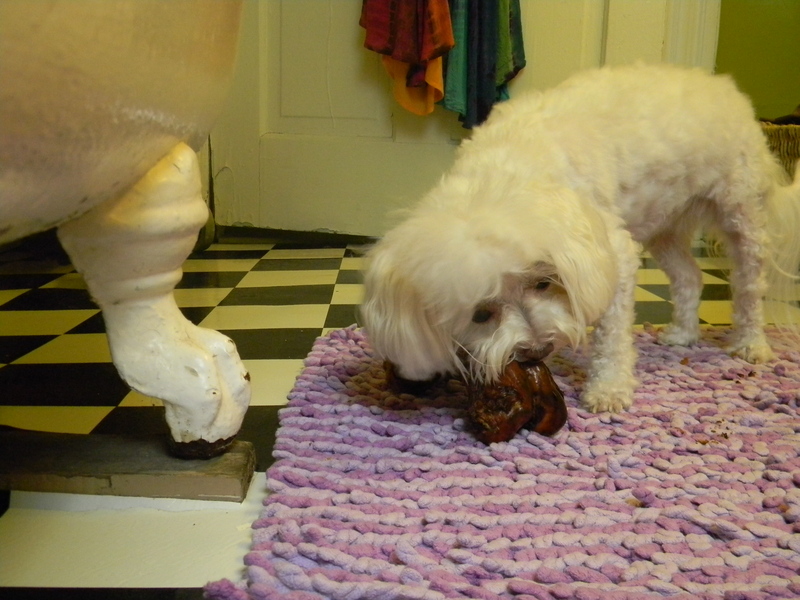 She loves the cool of the tile juxtaposed with the warmth of the rugs. It has become “her” space and she seems to tolerate our presence as we shave, do our hair, shower, etc. She’s happy to own the room, and I wouldn’t want it any other way! Thanks for stopping by. I hope you’ll come back! Lovely post! The photos illustrate it so well too. Lucy may be small, but she’s got tons of character. I like how she sees the bathroom as her territory. We have the same thing going on in our house with Rosie and Lucy (the cat) being fed separately so that Rosie doesn’t eat Lucy’s food. In our case we have a bedroom/store room which is called “Lucy’s room”. Somebody once (hearing us talking about Lucy’s room) thought I had a daughter called “Lucy”! I know I’m supposed to find long, hot baths nice and relaxing, but I can never stay in one for long. 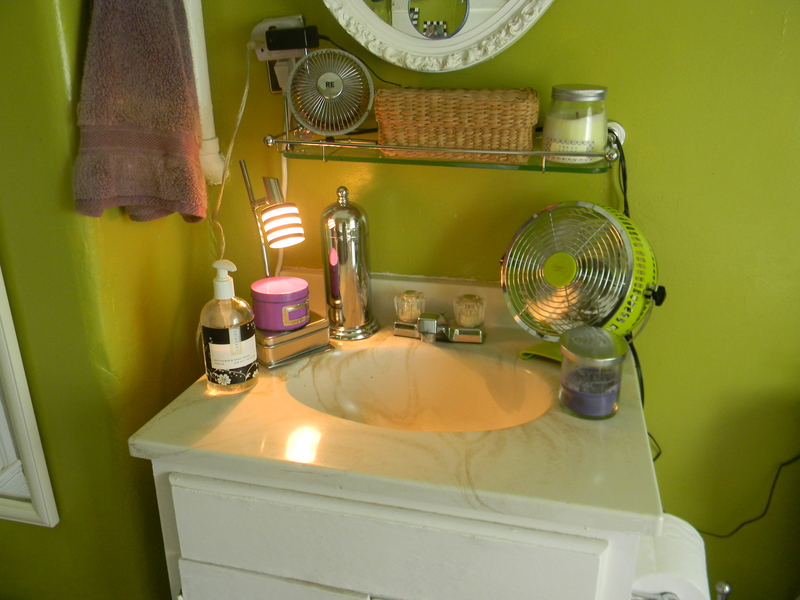 Average South African bathrooms tend to be smaller and functional, rather than a big room to spend lots of time in. What’s funny is that even though I’m a bath person and Sara a shower person, when Sara does take a bath, she spends way more time in the tub than I do. I enjoy my bathtub and love watching tv from there, but I’m more like you in terms of the amount of time I spend. I don’t like to hang out too terribly long. I enjoy it for a while, but max out pretty quickly. How funny that Lucy has a room of her own. We had to feed our cats in a place the dogs couldn’t access. the tv on the toilet tank cracked me up. I WON’T show him your bathroom tv…that would just be like poking an angry lion. I don’t blame you, Jane. If I had kids, I wouldn’t want them to have TVs in their rooms. There’s simply too much junk available to television, and as a parent I would want to monitor what my kids watch. Jake pretty much stays out of our bathrooms, although he whines miserably when Jim goes into the bathroom for a “constitutional” without him! 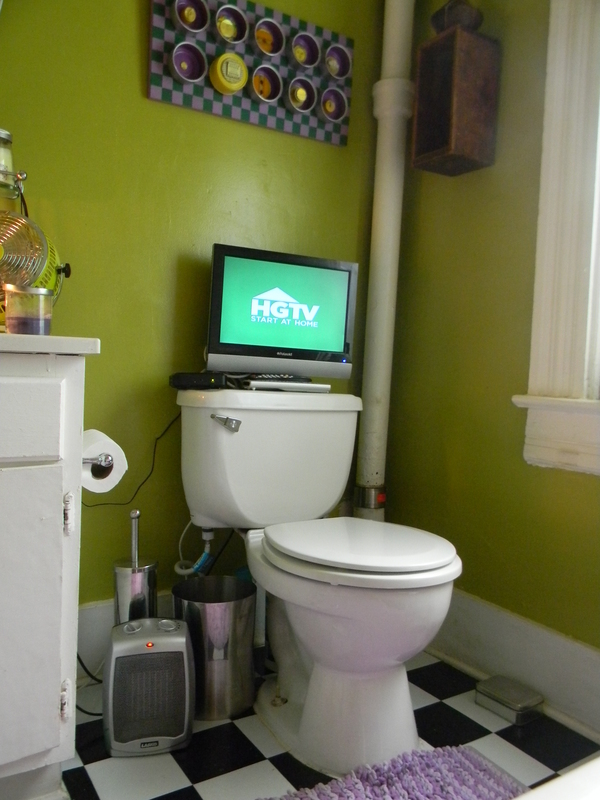 I’d never make it with a TV in my bathroom, especially on the back of the toilet…I’m way too big a klutz! How funny, Wendy! I am the biggest klutz south of the Canadian border, for sure! My concern is not the TV falling, but of my dropping a remote in the toilet. One of these days, I’m afraid, it may still happen! Glad I’m not the only klutz in North America! Cool, Charles–so glad you enjoyed this post! 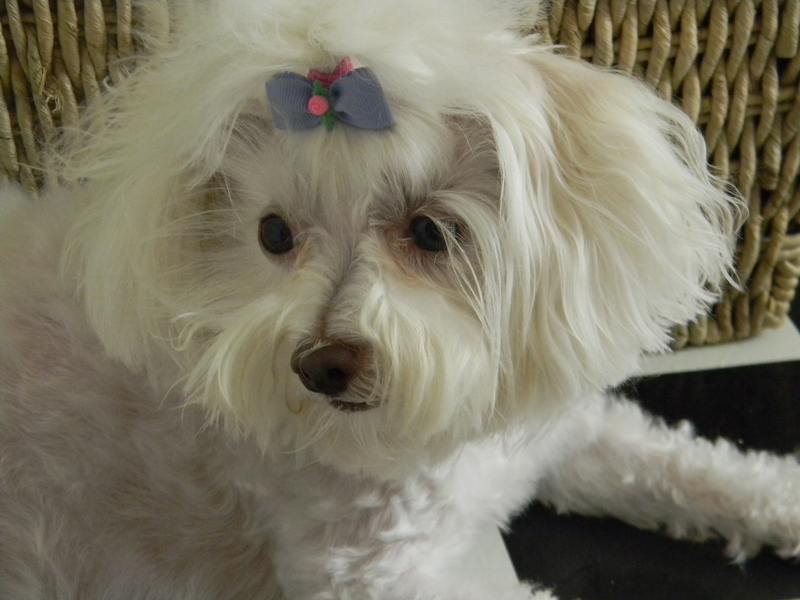 It was fun to put together—mostly because I enjoy taking photos of my silly dog! But, goodness, coyotes sound scary to me! I’ll stick with domesticated dog! Ha, ha! PS I’d love to introduce her to my boxer! This comment made me laugh out loud–HARD! Love it, Penny! Sara says the same thing about the bow! I’m such a silly MIss Pris! Thanks for the good laugh,my friend! I’m sure she’d love your boxer! If I had a t.v. 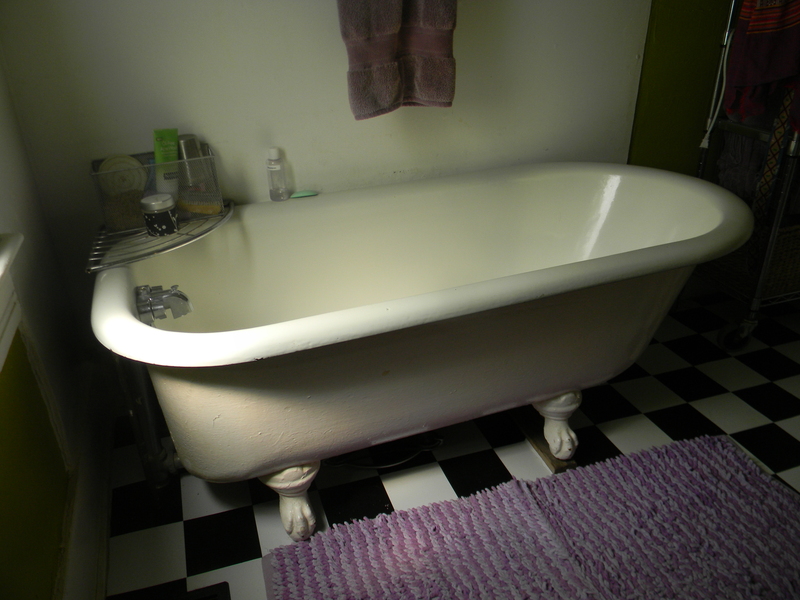 in my bathroom, I might never leave the bathtub. As it is, all I do is dust the bathtub. I get clean in the shower instead. How funny, Terri! I guess the thing could get dusty if you had a separate shower. A TV in the bathroom is pretty great, but I don’t think it would be the same watching if from a shower–so you are probably better off! When I was in college, we tended to like to prank each other. One Friday when I was off at a party, my neighbors moved the majority of my single into the dorm bathroom (which was incidentally a co-ed bathroom at the time). I liked the space so much that I stayed in there the whole weekend. It may have been the best room I ever had in college! I could have use a Lucy about to properly guard my new domain. There is much to be said for living in a Master Bathroom! How funny, Steve! When one of Sara’s colleagues in Haiti went back to eastern Europe to pack up his life there and move to Haiti full time, his friends had moved his entire apartment’s furniture into his office! There is, indeed, a lot to be said for living in the master bath! Thanks for reading, my friend! Holy Moly–I wouldn’t think of crossing her! You are wise, Tori–one canine-wise woman! Claw foot tubs are awesome. So are flat-screen TVs in bathrooms. Sadly, I’ve got neither. But I’ll live vicariously through you for now, I guess! You are welcome to live vicariously through me! Claw foot tubs are pretty cool. It’s one of the things I loved about the house when I bought it. 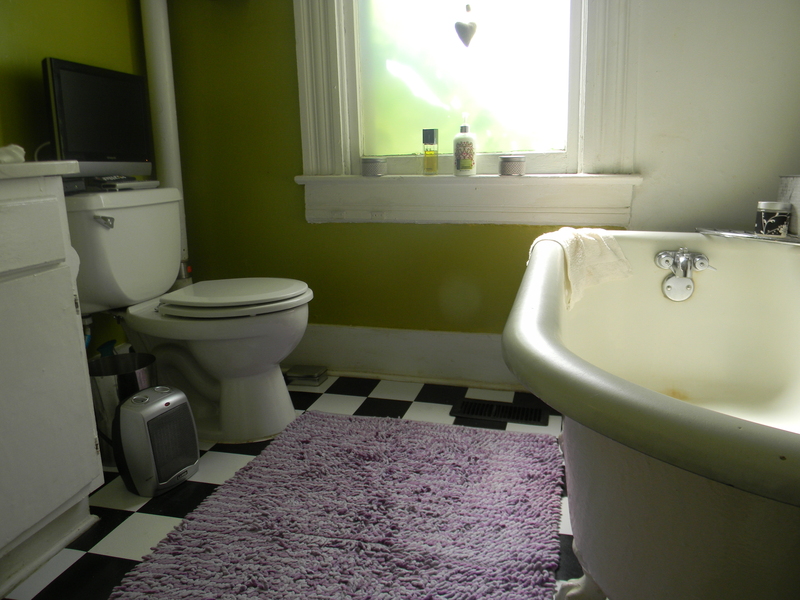 And TV from that tub is pretty cool, too! I’ll watch a foodie show for you! I think all who welcomes dogs into their lives must recognize the reality that human’s are not the masters, the dogs rule the world. My older dog has me well trained to get treats (or carrots) on demand, or be harassed to death by a cute fuzzy head pushing my laptop out of my lap. The younger dog knows that, despite his naughtiness, all he has to do is look at me with apologetic puppy eyes and all is right with HIS world. I love your bathtub and envy you the luxury of HGTV in a room filled with bubbles. Sigh. They do rule the US–that’s for sure! And they rule at our house! It’s the eyes that get me, as well! And the tilt of the head! TOOOOOOOOO cute! HGTV from the bath is pretty cool. I took that photo from the tub. Thanks for reading, Lisa! I wanna live in your master bathroom. With the dogs too. Loved reading this post, I happily share my Home with Monty, a Staffordshire Bull Terrier, he is my constant friend and is allowed privileges that no human has. I was also fascinated to find that Americans don’t always have Master bathrooms? Coming from little old England I have a very stereotypical Vision of the US and its Bathing habits, very refreshing to find another canine home sharer. lol! Great post. I have to share my bathroom with Izzy who thinks cats should love water and doesn’t understand why anyone would think they don’t. How funny, Robin. Does Izzy like the shower? I’m so pleased you enjoyed this post! Hope your week is going well. Cute post, Kathy. Looks like you’ve got a great retreat room set up there. Sounds like Lucy likes it too. I’m so glad you enjoyed this post, Marianne. It is, indeed, a great space for getting a good bit done. I think Lucy likes it because her big brother rarely comes upstairs, so she feels like it is more her space than other places in the house. That look on Ralph’s face is priceless! Pets bring so much joy. I just lost my baby (cat – Fred) and am struggling to get over it, but looking at your pictures reminds me that there is still room in my heart for some more animal souls. Ah, I’m so sorry to hear about Fred! Pets are precious, indeed. And you are so right about Ralph–that face never ceases to delight me! I’m honored my post made you think about another pet. That is high praise!